This spectacular bouquet is bursting with glorious colours to deliver you some floral sunshine! 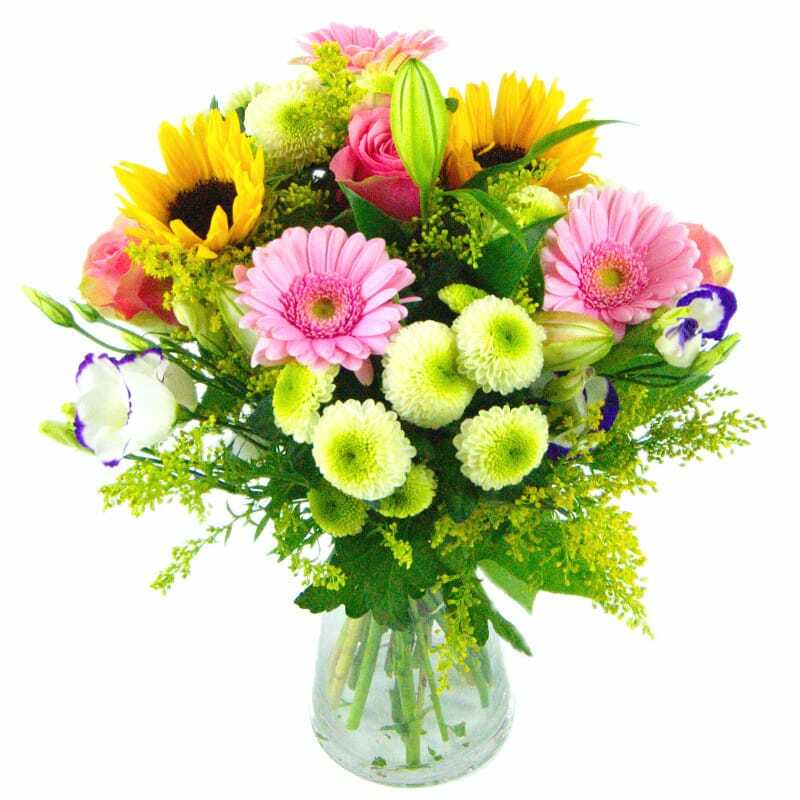 The Sunburst bouquet includes roses, germini and lilies amongst many other summery flowers. This bouquet is sure to intoxicate its recipient with good cheer and positivity! Perfect as a summer birthday gift or a house-warming gift, the Sunburst Bouquet could also make for a great gift to yourself if you're looking to treat yourself to a bouquet of flowers. This lovely bouquet is selected and arranged by our expert florists and then gift wrapped ready to bring some summer sun into your day. Have these flowers delivered 7 days a week throughout the UK. Your flowers will be delivered in our special delivery box to prevent damage while in transit, so they arrive in excellent condition all for just £34.99! For that extra special personal touch, why not add a Handwritten Greetings Card, a delicious box of Lily O'Briens Chocolates, a chic glass vase or an adorable teddy to accompany your beautiful fresh hand-tied Sunburst bouquet. We also have a large selection of flowers in our Flowers under £35 as well as a many arrangements containing roses, germini and an array of different gift sets to suit every occasion.